Monsignor Ignacio Barreiro was ordained a priest for the Roman Catholic Archdiocese of New York on Nov. 14, 1987. From the beginning of his priestly ministry, Monsignor Barreiro was involved in the Pro-Life and Traditional Latin Mass apostolates. He received his licentiate and doctorate degree in Systematic Theology from the University of the Holy Cross, in Rome, Italy. For a period of time in the 1990s, Msgr. Barreiro served in the Priestly Fraternity of St. Peter. Since September 1998, Msgr. 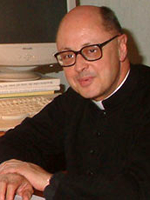 Barreiro has been the Executive Director of the Rome office of Human Life International. In Rome, he started an apostolate with priests and seminarians from all over the world who are studying in the Eternal City. Msgr. 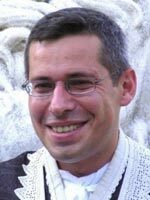 Barreiro has published hundreds of articles on theological and life issues, and historical subjects in popular and scholarly publications. He was appointed a Chaplain of His Holiness on March 26, 2004. 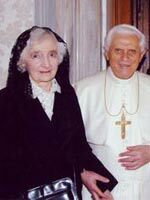 Dr. Alice Von Hildebrand was born in Brussels, Belgium in 1923. She received her doctoral degree in philosophy from Fordham University, where she studied under Dietrich Von Hildebrand. There she mastered his thought, collaborated with him and subsequently became his wife. Her thirty-seven year teaching career was connected to Hunter College in New York; and included the positions of lecturer, instructor, assistant professor and professor, prior to her retirement from teaching in 1984. To cap her teaching career, she received the Award for Excellence in Teaching from Hunter College President Donna Shalala at Madison Square Garden in New York City in 1984 in recognition for having the highest students' evaluation rating among all 850 tenured faculty members. Dr. Von Hildebrand is a noted author and philosopher who has published many works on her own, and also in conjunction with her husband. Most notable among these: "Greek Culture: The Adventure of the Human Spirit"; "Introduction to a Philosophy of Religion"; "The Art of Living; Morality and Situation Ethics"; "By Love Refined"; "The Soul of a Lion"; "The Privilege of being a woman"; and "Man and Woman: A divine invention." She has written and lectured extensively on women's issues throughout the United States, Canada, Mexico and Europe. She is proficient in six languages and is listed in five different categories of Who's Who Publications. Her remarkable accomplishments include the Newman Club's "William O'Brien Award" and the "Doctor Honoris Causis" Award from Franciscan University of Steubenville in 1988, and the "Doctor Honoris Causis" Award from Holy Apostles Seminary in 2010. In 2011 she was named Woman of the year by "Inside the Vatican" magazine. Raymond De Souza, KM is Brazilian by birth, Catholic by grace and American by choice. He is the Special Missions Coordinator for Human Life International and regularly travels to countries in all continents to represent HLI to refute the culture of death and promote the Gospel of Life. Raymond has distinguished himself as an international Catholic Pro-Life activist, Apologist, author and broadcaster. Fluent in English, Spanish, French and Portuguese and also having conversational ability in Italian and Afrikaans, he has given over 2,500 talks on issues of Pro-Life, Catholic Apologetics and related topics, in person, on radio and television. His work has assisted religious education programs at parishes, schools, and lay organizations in 15 countries of five continents. 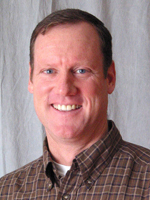 He has a syndicated weekly column on Catholic Apologetics in the national Catholic newspaper, the Wanderer. Lt. Col. David L. Sonnier (RET) is a 1981 graduate of the United States Military Academy (West Point) and holds a MS in Computer Science from Georgia Institute of Technology. He spent twenty years as an officer in the US Army, where he served in the Infantry, Special Forces, and as a computer specialist. He has been teaching at Lyons College in Batesville, Arkansas for over ten years, and has published a number of academic papers in the areas of parallel processing and multiobjective optimization. During his time in the Army he promoted the rights of Catholic servicemen to their Catholic heritage, including their right to be able to attend Mass in what is now sometimes referred to as the Latin “Extraordinary Form.” These efforts were carefully documented and published in his 2007 book Rightful Aspirations (Goretti Publications). Other published works are “Child Molestation by Homosexuals and Heterosexuals,” Homiletic and Pastoral Review, May 2005, with Brian Clowes, “Ecclesiastical Aggiorniamento and Exponential Decay Functions: A Statistical Analysis” with Albert P. Marcello III. In 2008 he founded Saint John Bosco Academy, where he teaches one of the upper-level mathematics classes every year. Dave and his wife Laurie have seven children and reside in Batesville, AR. 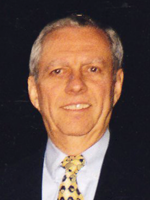 Roland H. Fredette earned a BS in Business from Northeastern University in 1958 and a MBA from the University of Scranton in 1965. He served his country as an officer for two years in the U.S. Army. After a year with Western Electric as an industrial engineer, Roland spent the next 29 years at IBM in staff and management positions at the location, division, and business group headquarters. Retiring from IBM in 1991, he researched several business opportunities and in 1995 founded World-Class Business Services, Inc. which he operated until 2000. Roland is active in his parish community, attending daily Mass and volunteering at the local Catholic hospital. Roland and his wife Flore have eight children and are the proud grandparents of 15 grandchildren, five of them adopted. Active in the pro-life, pro-family apostolate, they are annual participants at peaceful pro-life demonstrations at the Georgia State Capital, Life Chain events, supporters of the local crisis pregnancy center, and strong supporters of pro-life, pro-family legislation and legislators. 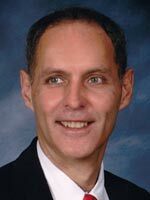 Joseph-Henri Fradet is the Founder and Executive Director of Christendom Restoration Society. Having a life long passion for being of service to Holy Mother Church, previous positions included Catechist for mentally handicapped children, Member of the Board of Directors of the Faith Enrichment Institute in Atlanta, GA, and Executive Vice President and Member of the Board of Directors of the National Coalition of Clergy and Laity. In support of His Holiness, Pope John Paul II’s 1988 motu proprio Ecclesia Dei, issued to encourage the wide and generous application of the 1984 directive Quattuor abhinc annos issued by the Congregation for Divine Worship of Apostolic See, Joseph helped found and served as Chairman of The Traditional Latin Mass Committee of Atlanta. As Chairman, he functioned as a liaison between The Priestly Fraternity of St. Peter (an international Society of Apostolic Life) and the Archdiocese of Atlanta. With the blessing of Archbishop John Francis Donoghue to found a permanent community, he also served as the budding community’s Administrator until a full time priest was assigned. The Committee’s efforts resulted in the founding of St. Francis de Sales Catholic Parish, one of the first canonically erected traditional personal parishes in the world. Inspired by his mother’s pro-life advocacy which she began even before Roe v. Wade in 1973, Joseph has been deeply involved in pro-life work for most of his life. Endeavors include participation at conferences and peaceful pro-life demonstrations in Washington, DC, Georgia, Texas, Oklahoma, Montreal, Ottawa, Toronto, Canada, and in Paris, France, many of which were hosted by Human Life International. He has served on parish and archdiocesan pro-life committees, and founded and chaired a committee to support Advice & Aid Pregnancy Problem Center, hosting their first charity ball which has been an annual event for over a decade. This event serves not only to provide much needed financial support, but also promotes community awareness of their life-saving services and serves as a means for recruiting new volunteers.